Signor Federico Tesio is one of the greatest Thoroughbred breeders in the history of the turf. Considered by many as a genius when it comes to breeding Thoroughbred horses, Tesio not only ran his breeding operation but was also the trainer of his exceptional stable. He and his wife Lydia established Dormello Stud in Novara on the banks of Lake Maggiore, Italy in 1898. From here some of the greatest Thoroughbreds were born and raised. The Wizard of Dormello was not exactly overly wealthy, although he was wealthy enough, and therefore he was not always keen to rush his best mares to the courts of the most expensive stallions. Tesio would breed his mares to sires which he thought were a perfect genetic cross. He studied pedigrees to the seventh generation, sometimes as far back as the twelfth generation, looking for the characteristics that in his mind suited his broodmares. His theories in breeding were revolutionary and coupled with painstaking research and patience, were quite against the norm of breeding the best to the best and hope for best. He often bred his horses for future generations as opposed to instant success in order to culminate with the one ideal horse which combined all of the characteristics he would look for in a champion. Tesio, with the help of his wife, kept meticulous records when breeding his mares. Together they would record everything from personality traits to conformation, colour, and racing ability. He famously quoted; “A horse runs with his lungs, preservers with his heart, and wins with his character”. One of his obvious favourite horses in the pedigrees of his champions was St. Simon, a horse he considered to be a possessor of the many attributes he looked for in a champion. He won the Derby Italiano an astounding twenty-two times with Thoroughbreds he not only bred but also trained. Several of his champions were undefeated in their careers. These include Braque, Botticelli and Cavaliere d’Arpino, whom he considered the best he ever bred. Cavaliere d’Arpino sired Bellini, the sire of Tenerani who in turn sired the great undefeated Ribot, all Tesio bred champions. Donatello II was another one of his great Thoroughbreds who was undefeated until his last race, and would go on to become a very influential sire to future generations. The impact of his breeding success spread throughout the world. One of, if not his greatest achievement in breeding was his undefeated champion Nearco. From this outstanding horse came the strongest continuing sire lines today, showing no sign of being surpassed. Nearco was foaled in 1935 at Dormello from the broodmare Nogara by Havresac II who was a son of Rabelais, a son of St. Simon. Nearco’s sire was Pharos by Phalaris. Pharos was out of the great broodmare Scapa Flow by Chaucer who was by St. Simon. So therefore Nearco was inbred 4 x 4 to the legendary St. Simon, who is also in his fifth generation twice. Other notable sires in his pedigree were Carbine and Ajax, fourth generation, and Tristan in his fifth generation. He was a dark bay or brown horse, who looked almost black, standing 16.0 hands at full growth. He was described as a difficult horse to be around, possessing a strong will with a quick temper. He was especially nervous around large crowds and despised being groomed or touched. He won every one of his fourteen races with such ease that one has to wonder what his response to a serious challenge might have been. All but one, his final start, of his races came in Italy. His last race was the Grand Prix de Paris, the most prestigious race in France for three year olds at that time even though it is not considered as one of the classics. The race was a one and seven eighths miles (fifteen furlongs) test of speed and stamina. The field was stellar as the Epsom Derby winner Bois Roussel, Prix du Jockey Club winner Cillas, and the runner up Canot, the filly Feerie, winner of the Prix du Diane and Poule d’Essai des Pouliches, were all entered. Nearco won the race by one and half lengths under a hand ride. Canot was second and Bois Roussel was third. He had demonstrated his class and dominance against some of the top three year olds of his generation. Tesio then sold his prized horse to Martin Benson, owner of Beech House Stud, Newmarket, for stud duty, the price being 60,000 pounds. Tesio was not averse to selling his best sire prospects to other countries in Europe as in his own words; “By keeping every stallion at home there would bring a tendency to breed your own mares to them, just for the sake of convenience, would not be beneficial”. Also with his home government’s alliance to the Nazis having been recently announced, Tesio wanted Nearco in a safer environment for his new career. Tesio always kept shares and or breeding rights to his imported stallions anyway. Nearco was the beneficiary of a specially constructed bomb shelter at Beech House when World War II broke out and England came under attack. 1940 would turn out to be an important year in Thoroughbred breeding history as the first crop of Nearco foals were born then. Two years later these young sons and daughters of this new sire came out running and the turf world would never be the same. His first starter was the filly Nearly when she appeared in the Fitzwilliam Stakes at Newmarket on April 15, 1942. She won. From Nearco’s first crop came other stakes winners as well. Lady Sybil would become the champion filly for 1942 and go on to be a very highly rated mare. Cimbrone was a speedy sort, and there was Nasrullah. Bred by the Aga Kahn III, Nasrullah left an indelible mark in Thoroughbred breeding history. A grandson, tail female line, of the Aga Kahn’s great foundation mare Mumtaz Mahal, Nasrullah was out of Mumtaz Begum by Blenheim II. He was brilliantly fast, head strong and full of character. He stood his first six breeding seasons in Ireland and then was exported to Claiborne Farm in Kentucky in 1950. Nasrullah led the English/Irish sire list once and the North American sire list five times. Among his most notable offspring of importance in racing and breeding are Nashua, Bold Ruler, Never Bend, Never Say Die, Grey Sovereign, Red God, Bald Eagle, Indian Hemp, Jaipur, Leallah, Noor, Zucchero, Courtesy, Dangerous Dame, Glamour, and Zonah. Nasrullah was a sire of immense influence and lasting effect to the Thoroughbred breed. This son of Nearco is acclaimed as one of the most important stallions of the twentieth century. However he was not the only son of the great Italian stallion to make a profound mark on the breed and contribute superbly to future generations. Mossborough by Nearco was a five time winner from fourteen races and was just a slight cut below his top contemporaries on the track. He would however sire two very important horses. The filly Noblesse, winner of the Epsom Oaks by ten lengths, she was the champion two year old in 1962 winning the Blue Seal Stakes and Timeform Gold Cup, the only filly to have won this prestigious race. She is the great grand dam of Rainbow Quest and Commander in Chief. The other important offspring Mossborough sired was Ballymoss. Trained by the legendary Vincent O’Brien, Ballymoss won the Irish Derby, the St. Leger Stakes, the Prix de l’Arc de Triomphe, the King George VI and Queen Elizabeth Stakes, the Coronation Cup and the Eclipse Stakes. He ran second to the very good Crepello in the Epsom Derby. At stud he sired Royal Palace (2000 Guineas and Epsom Derby) and was broodmare sire of Stage Door Johnny, Levmoss, Le Moss and Teenoso. Dante was another classic winning son of Nearco. Dante became the leading English two year old in 1944 winning all six of his races which included wins in the Coventry Stakes and the Middle Park Stakes. As a three year old he started his campaign by winning the Roseberry Stakes then in the 2000 Guineas he suffered his only defeat, finishing second to Court Martial with Royal Charger third. His final race was his crowning achievement as he won the Derby, run at Newmarket due to wartime restrictions, beating Midas and Court Martial. Dante was retired to Theakston Stud in North Yorkshire. He was suffering from an eye condition that would eventually cause complete blindness. However, Dante had a successful career as a stallion until his death at the age of twenty-four. Among his get were Toulouse Lautrec, Darius (2000 Guineas, Champagne Stakes), Carroza (Epsom Oaks racing in the Queen’s silks) and Discorea (Irish Oaks). Sayajirao was a full brother to Dante. Sayajirao was purchased as a yearling for 28,000 guineas, which was a very large amount for a yearling in 1945. He would go on to win the Irish Derby and the St. Leger at Doncaster. At stud he sired Indiana (St. Leger), Gladness (Ascot Gold Cup), Lynchris, Zenobia, and Dark Issue, the latter three being winners of the Irish Oaks. Nearco sired Amerigo, who raced in England where he won the Coventry Stakes as a two year old and then shipped to the U.S. Amerigo was one of the cranky sons of Nearco and his temper would be his undoing several times. However when he put his mind to it Amerigo could fly and among his many stakes wins on the western continent were the San Juan Capistrano and the Hialeah Turf Cup. At stud he sired Fort Marcy (U.S. Horse of the Year) and the tough mare Politley, winner of twenty-one races from forty-nine starts. His daughter Grisse Vitesse, a stakes winner in France (Prix Jacques le Marois) would produce the good stakes winner Silver Hawk by Roberto. Royal Charger became one of Nearco’s more important sons in continuing the male line to future generations. He was a chestnut colt out of Sun Princess by Solario. Royal Charger’s dam was out of Mumtaz Begum (dam of Nasrullah) who in turn was out of Mumtaz Mahal. Royal Charger was not of the top echelon of his generation but he was a good quality race horse. No wins at two he showed enough promise to be entered in the 2000 Guineas as a three year old where he finished third to Court Martial and Dante. Later in the year he won the Challenge Stakes and the Duke of York Stakes. At four he added the Queen Anne Stakes and the Ayr Gold Cup to his resume. Royal Charger was sold for 55,000 pounds and stood at the Irish National Stud. While there he sired Happy Laughter (Irish 1000 Guineas), Royal Palm (Nunthorpe Stakes), Royal Duchy (Phoenix Stakes), and Sea Charger (Irish 2000 Guineas and St. Leger). He also sired Turn-To (Flamingo Stakes, Garden State Futurity) during this time. In 1951 Royal Charger was sold again, this time to Neil McCarthy for $300,000 to stand stud at Spendthrift Farm in Kentucky. He would go on to sire Idun (U.S. champion filly at 2 & 3), Mongo (Champion Turf Horse), and Royal Orbit (Preakness Stakes). As a broodmare sire his daughters produced such notables as Crowned Prince (champion two year old in England), Tudor Queen (champion two year old in the U.S.), and Majestic Prince (U.S. Hall of Fame). It is through Turn-To where Royal Charger takes his place in many of today’s top pedigrees as Turn-To would sire the influential Hail to Reason who in turn sired Epsom Derby winner Roberto and Halo. From the latter two came additional great sires Brian’s Time, Kris S and Sunday Silence, the latter being the sire of one of today’s top sires in Deep Impact. Another branch from Turn-To that became a successful sire line was First Landing, as well as that one’s son Sir Gaylord. Sir Gaylord sired many stakes winners including the great Epsom Derby winner Sir Ivor. Sir Ivor is found in the pedigrees of many champions through his exceptional daughters and his great son Sir Tristram. A bay colt by Nearco named Nimbus won the 2000 Guineas and the Epsom Derby in a very successful racing career. As a two year old he won two of five races, the Coventry Stakes and the July Stakes. At three he began his campaign with victory in the Classic Trial Stakes then beat favoured Abernant in a thrilling close finish in the 2000 Guineas. His Derby victory was just as close but with Amour Drake and Swallow Tail his victims instead. His final race was a walkover at Haydock Park. He was injured in training shortly after and was subsequently retired from racing. Nimbus was not a big success at stud but he did sire Nagami (Coronation Cup and Italian Derby), Nucleus a multi stakes winning mare, and Stratus, a sire of stakes winners in Canada. He was also the broodmare sire of 1962 Preakness Stakes winner Greek Money. Nimbus was sent to Japan in 1963 and stood stud there until his death in 1972. Nearco’s son Nearctic was conceived in England but foaled in Canada at Windfields Farm in 1954. He was bred by E.P. Taylor and went on to a solid racing career becoming the Canadian Horse of the Year in 1958. Nearctic looked very much like his sire and possessed much of Nearco’s strong will and blazing speed. Nearctic became one of his sire’s most important sons at stud, siring many champions and stakes producing broodmares. He is of course always remembered as the sire of Northern Dancer, the most important stallion of the twentieth century. Nearco’s daughters are not to be ignored as major contributors to future generations of Thoroughbred stars. Malindi was a stakes placed full sister to Nasrullah. She would then add to the family fortunes by producing Prince Taj by Prince Bio. Bred by The Aga Kahn, Prince Taj won the Prix de Saint-Firmin and was third in the Poule d’Essai des Poulins. He was sent to the USA but did not place in ten starts. Returned to France he began his stud career and from modest beginnings he rose to become the leading sire twice (1967-1968). Neocracy was one of the better broodmares sired by Nearco. Her dam was Harina by Blandford. Neocracy won the Princess Elizabeth Stakes and after retirement from racing produce Tulyar by Tehran. Tulyar was bred by the Aga Kahn III and would become his fifth Epsom Derby winner. Tulyar also won the King George VI and Queen Elizabeth Stakes, the St. Leger Stakes and the Eclipse Stakes. A second major stakes winner produced by Neocracy was Saint Crespin by Aureole. Saint Crespin won the Prix de l’Arc de Triomphe in 1959 as well as the Eclipse Stakes, Prix de Guiche and as a two year old the Imperial Produce Stakes. Noble Lassie, out of Belle Sauvage by Big Game, captured the Lancashire Oaks on the track and later produced Prix de l’Arc de Triomphe winner Vaguely Noble by Vienna. Vaguely Noble also won the Observer Gold Cup, Prix de Chantilly, Grand Prix de Saint-Cloud and the Prix de Guiche. Vaguely Noble went on to have a very solid stud career as he is the sire of Exceller, Dahlia, Gay Mencene, Nobiliary, Lemhi Gold and Empery. He is the dam sire of Dahar, Golden Fleece, River Memories, Touching Wood, Indian Skimmer, and L’Emigrant. Noorani by Nearco – Empire Glory by Singapore won only one race from twelve starts. The one race was the Duke of York Handicap. She would however produce two stake winning sons. Sheshoon by Precipitation won the Grand Prix de Saint-Cloud, the Ascot Gold Cup and the Grosser Preis Von Baden. He had a very good sire career with Sassafras being his most notable son. The other son of Noorani to make an impact was Charlottesville by Prince Chevalier. Charlottesville won the Prix du Jockey Club, Grand Prix de Paris, the Prix Lupin and the Prix du Prince d’Orange. 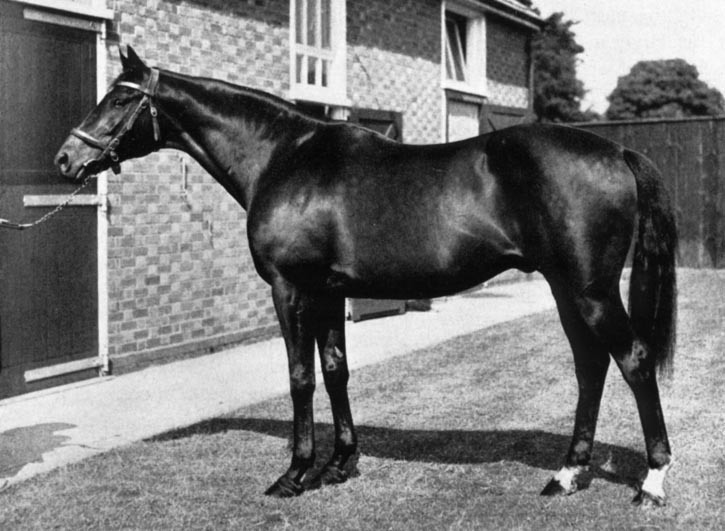 At stud he led the British/Irish list in 1966, the year in which his son Charlottown won the Epsom Derby. He also sired stakes winner Nasreen, dam of Sharmeen (dam Of Shergar). Sybil’s Sister is a full sister to Lady Sybil, the first stakes winner and champion sired by Nearco. Both are half sisters to Lady Angela, the dam of Nearctic. Sister Sarah is the dam of these three siblings, she being by Abbots Trace. Sybil’s Sister would produce Sybil’s Nephew by Midas, who won the St. Leger Stakes and Sybil’s Niece by Admiral’s Walk, winner of the Queen Mary Stakes. Sybil’s Niece would then produce Great Nephew by Honeyway. Great Nephew won the Prix du Moulin and Prix Dollar and later lead the English/Irish sire list twice. He is the sire of Epsom Derby winners Grundy and Shergar. These have been some of, but not all of Nearco’s best sons and daughters who have spread his considerable influence throughout the Thoroughbred world. Many of them inherited his legendary temperament as well as his supreme racing ability. During his first year at Beech House, he had gone through ten different grooms in ten months as no one was able to handle his impossible character. One day in absolute frustration his owner called on veteran stud groom Ernie Lee, who was well known as a good handler of difficult stallions. Within a few short weeks Lee had Nearco not only trusting him but also trained to enter his bomb shelter at the sound of the air raid siren and stay there until Ernie would lead him out. Nearco was still mistrusting to anyone else but when in the company of his beloved friend Ernie he was docile and co-operative. Nearco contracted cancer in his hip which made getting up or down very painful. On June 7, 1957 he was unable to stand on his own. Once Lee was able to get him up, he walked the horse to the nearby Equine Research Station where Nearco was humanly euthanized. Devastated, Lee walked away and never worked with horses again. In the history of the Thoroughbred there are exceptional sires and then there are breed defining sires. Nearco is a breed defining sire of the highest influence. The Italian Stallion bred by “The Wizard of Dormello”, a great sire of sires. Fascinating article. Especially love the photo that shows how big, beautiful and feisty he was. I look forward to the future articles. I have always enjoyed following the career of fredico tesio. I actually keep an early addition of one of the first books about him on my desk. I feel like it helps me maintain a good perspective on the horse industry. Nasrullah and Nothern Dancer have been, and are still my key sires for my Kentucky Derby picks. well. I have done well with these two special animals.